Springfield, New York—Many people have passed through Hyde Hall over the years—five generations of the Clarke family and their friends and servants—each with their own history of love and loss. Some of them never left, or so say the legends that have grown up over the last 150 years around the venerable pile of stone that took George Clarke almost 20 years to finish. The 2015 edition of The Haunting of Hyde Hall spotlights three family members and one family friend whose lives ended tragically. The first vignette focuses on a tragic summer afternoon, when a young man suffered the unbearable rejection of his love. On the afternoon of July 31, 1884, a cousin of the Clarkes, Theresa White was being rowed home by her friend and would-be beau, Edward Steers. Steers was a handsome, vibrant young man summering in Cooperstown who, according to some accounts, proposed to Ms. White after debarking their rowboat. Subsequent events are still being debated! The second vignette dramatizes the fate of young George Clarke who joined the Air Force during WII, while his sister Susan flew supply missions stateside. 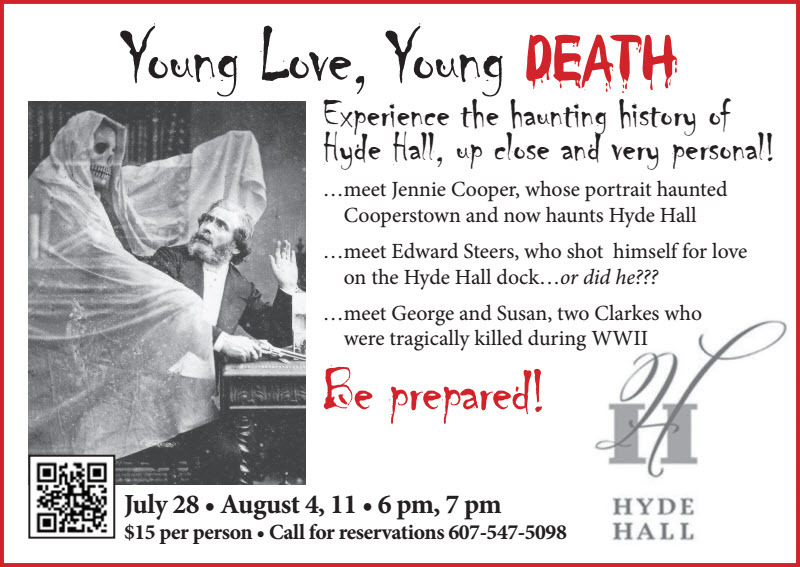 This year’s Haunting of Hyde Hall spotlights their fiery deaths, along with the ghostly radio transmission heard by a craftsman 40 years later that transcended time and seemed to originate in George’s plane! The final vignette features Jane “Jennie” Cooper Worthington, whose portrait now graces Hyde Hall’s palatial dining room. Jennie married John Worthington at age 20, and died of consumption less than six months later. Her heartbroken husband, who knew of her illness when he urged their marriage, had the portrait commissioned posthumously and hung in Greencrest, the house he built on River Street for his second wife. Stories rapidly circulated about the new wife’s distress at seeing Jennie’s life-size portrait prominently displayed in the main stair hall of her home. When the second wife tried to remove the portrait, pots and pans in the kitchen rattled and flew about, doors slammed shut, and peace could only be restored when the painting was returned to its place of dominance and honor. This popular series of evening tours is offered July 7th, 14th, and 28th, and August 4th and 11th, at 6:00pm and 7:00pm. Tours are limited in number, so reservations are recommended. The cost is $15 per person; call 607.547.5098 for reservations. 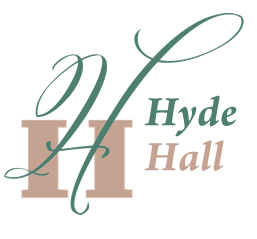 Hyde Hall (hydehall.org.mylampsite.com), a National Historic Landmark and New York State Historic Site, was built between 1817 and 1834 as the centerpiece of a 60,000-acre estate inherited by George Clarke, a British-born landowner. It was inhabited by direct descendants of the Clarke until the 1940s. It is open for guided tours from May through September, and visitors of all ages will enjoy its beautiful grounds overlooking Otsego Lake and touring its rich collection of furniture, paintings, and decorative arts. It is located on the grounds of Glimmerglass State Park in Springfield, New York, eight miles north of Cooperstown.